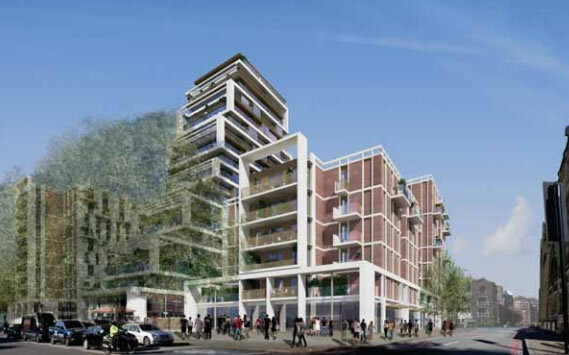 Planning application 2015/0881 and 2015/0934 is proposing to demolish Homebase on 198 York Road, to be replaced by 3 part 2,6,7,9,11 and 20 storey buildings to provide 261 residential units and 2000 sqm of business, bar and nursery space. Homebase is due to close at the end of 2015 and will be vacated for the proposed development. 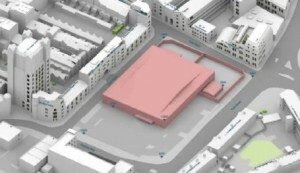 Current 3D view of the site. Proposed 3D view of the site. The dwellings should comprise 4 studios, 48 one bedroom-flats, 133 two bedroom-flats, 46 three bedroom-flats and 30 maisonettes styles (1 and 2 bedrooms). 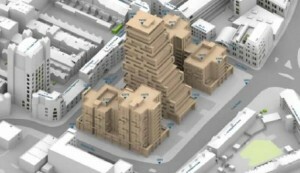 Planning rules suggest maximum 9 storeys… therefore submit 20! Knowing as Wandsworth Council is considering its planning policies, what would you do as a developer? Submit some buildings of 9 storeys as advised in the documents? You foolish… go for 20 at least! No justification was offered for the height of the central tower particularly when the Council’s policy states that tall buildings (at 9 storeys and above) in this location are likely to be inappropriate. A building of this height could not fail to make its presence felt however carefully the set-back angles are calculated. No convincing reason was offered as to why the Council’s stated policy should be ignored. The second concern with the central tower was that the architectural ambition for this site was if anything, too ambitious. […] We strongly doubt that the quality of materials and detailing will ultimately be delivered on a site such as this where the values are unlikely to justify them. Nothing would be sadder than if the final result was a “dumbed down” version of the current rather exuberant design. In the opinion of the Panel [removal of the trees along Gartons Way] would be a pity and we felt that the implications of keeping the trees had not been properly presented. Such an option is certainly feasible albeit at a loss of development volume. Without a convincing case for the removal of these trees the Panel did not feel minded to support the proposal as it stands. From the plans and discussion it was clear that there were a number of unresolved issues about the public realm to this street, apart from the ramp referred to above. These include the design and function of the public space in front of the proposed concierge to the Tower, the management of the refuse collection at street level and vehicular parking to the lay-by. There are currently 32 objections from local residents and amenity society (and no support). Wandsworth own planning documents states (SSAD) that the site is inappropriate for buildings more than 9 storeys high. All of the surrounding buildings are 5 storeys or less. The obvious justification for the height and massing proposed for this location (and we hardly believe that the Design Panel failed to perceive the odds, as this is the usual justification for any breach of policy) is the viability of the scheme in respect to the value of the land. However this wouldn’t be the case if Wandsworth Council was not used to ignore its own rules and permit all sort of developments, whatever incongruous to the area they might be. In summary, the report states: “the effect of the construction of the proposed scheme upon 84% (NSL) of the surrounding residential rooms is considered to be negligible in nature on the basis that the daylight amenity alterations“. However, the proposed developments shows a major loss of daylight for some adjacent buildings (p12). Out of 619 windows observed in the study, 333 are showing more reduction than the 20% BRE permitted guidelines (Vertical Sky Component – if the amount of skylight falling on a vertical wall or window decrease by more than 20%, occupants will notice a change) with 109 being “Major loss”. Amongst them : 1 – 8 Windward House (40% will loose more than 40% daylight), 1 – 4 Square Rigger Row (53% will loose more than 40% daylight), 7 & 14 Port House (70% will loose more than 40% daylight), 46 – 51 Candlemakers (86% will loose more than 40% daylight), 52 – 72 Candlemakers (32% will loose more than 40% daylight), 1 – 24 Wheeler Court (21% will loose more than 40% daylight). Despite those figures the reports maintain that the changes are negligible! 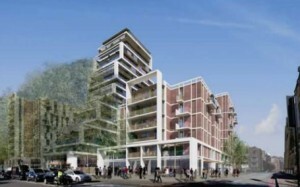 As usual for sites in Wandsworth, the applicant is not providing the minimum provision for affordable housing as stated in the London and Wandsworth plans. A mere 11.5% affordable housing is proposed (1 and 2 bedroom-flats as intermediate housing, no social housing). On individual sites a proportion of at least 33% of homes should be affordable, however, higher provision will be sought where viable. As the possibility to dish the affordable/social conditions as well as the height limitation are all factors increasing the site value, there is no surprise that it creates that viability issue. However, even with that consideration, the BNP Paribas advisors wrote that “the proposed Development is unviable with 100% private housing on the basis of current costs and values“. Therefore it questions either the accuracy of the advisors report, or the calculation of the developers (especially with the Design Review panel views to seek the highest quality of material). As highlighted by the Design Panel we regret the removal of the mature trees along Gartons Way. Over 261 units, there is only provision for 104 parking spaces. As usual, the new scheme fails to recognise the car parking requirements for the area (in particular the over night demand caused by the residents at the Travel Lodge and during the week). In addition it must be noted that York Road is heavily used during the day and often congested at pick hours. This over-development will only exacerbate the existing situation. Decision is to be made by Wandsworth Council committee on May 21st.